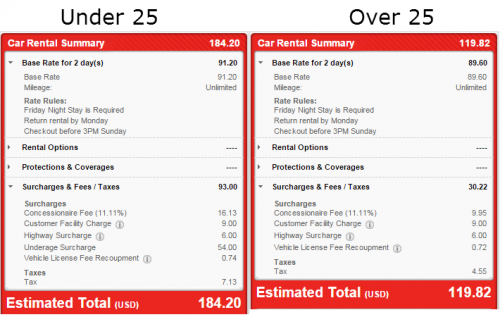 If you’ve ever had to rent a car while you were under the age of 25, you probably know that car rental companies add excessive fees to the rental. There’s no lack of statistics showing that drivers under the age of 25 are more likely to get in an accident, but charging an extra fee of $15-$40 a day is just absurd. 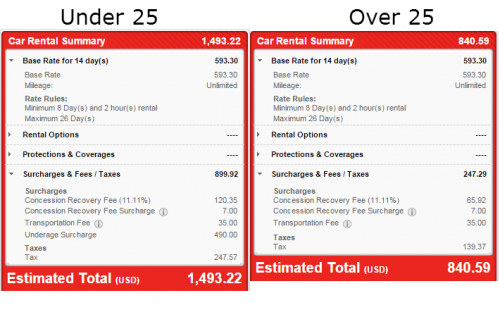 C’mon, car rentals charge enough fees already! Just take a look at these examples. Isn’t it just crazy how expensive under age fees are? 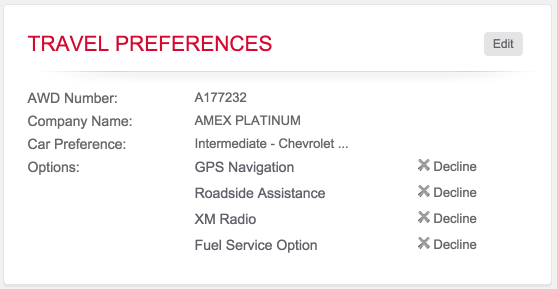 I’m 22, I’ve been driving for 6 years with zero accidents to my name, and I’m an Avis Preferred member, yet they still try to charge these exorbitant prices. It’s just nuts. Fortunately, there is a way to avoid these fees and that’s by booking with USAA. USAA, “United Services Automobile Association” is a group of companies that offer banking, investing, insurance, and other services to past and present members of the Armed Forces and their immediate families. Despite USAA being primarily for individuals who were/are in the Armed Forces and their families, they do offer memberships and certain benefits to everyone. Underage rental fee waivers are one of the benefits, as you probably guessed. So, how do you take advantage of this? 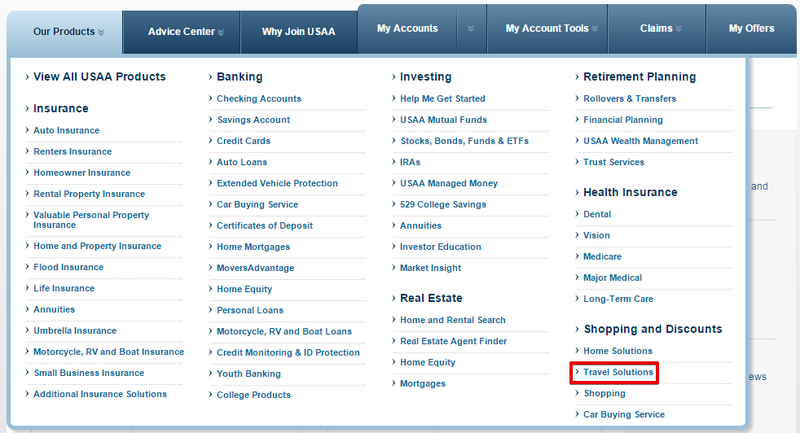 Well, to start, head over to usaa.com and sign-up for an account if you don’t already have one. As a side note, you will be required to give them your social security number to verify your identity. After you register and login to your account, click on “Our Products” and select “Travel Solutions” in the bottom right corner. 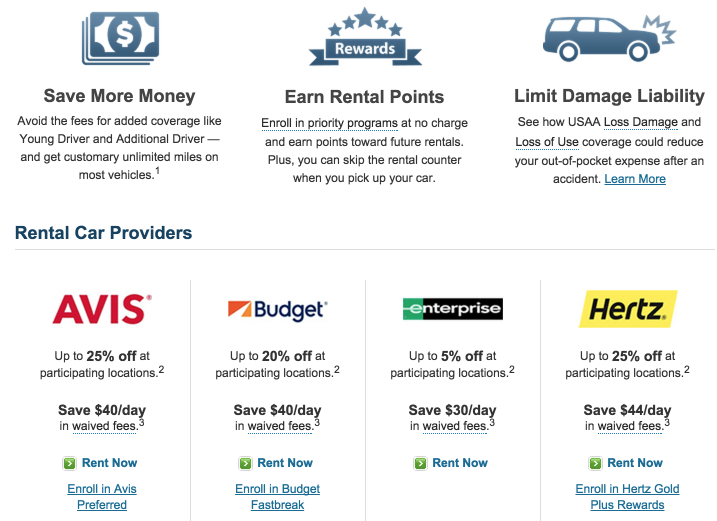 From there, select “Car Rentals” and scroll down to select what rental company you want to use. 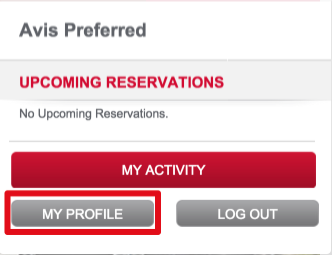 I always use Avis, because I have Preferred status with them. 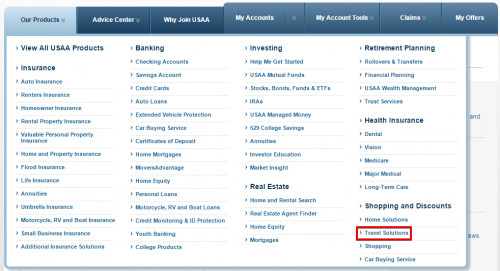 *Liabilities coverages only ably if you have a financial product with USAA. You do need to be a current or past member of the Armed Forces or an immediate family member to/from one to get one from USAA. Scroll down and edit your travel preferences. You’ll want to edit the AWD number to display A177232. That’s the code for the USAA waivers. If you have anything else for your AWD Number (it defaults to the number for Amex Travel), then you’ll have quite a painful time getting the fee waived. I’ve rented two cars through Avis using USAA to waive the underage fees, but both times I still had the Amex Travel AWD number on my account, so it wasn’t a smooth process. Both times I finished the checkout price with one price, but when I returned the car I had a new bill showing an underage fee. Then, after a long argument, they would remove the charge, but it was such a pain! After the second time this happened, I realized that my account had the Amex Travel AWD Number on it, so I removed that and changed it to the USAA number. 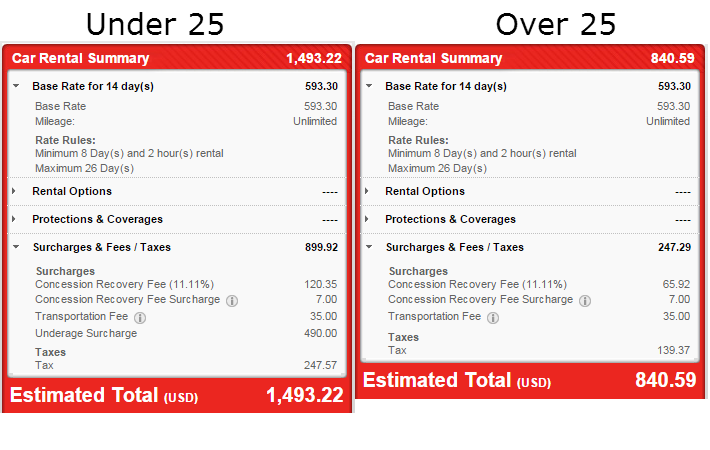 I haven’t rented a car since then, but I don’t anticipate a problem. There are rumors flying around the interwebs saying that these rental companies are getting smarter and requiring you to have a USAA credit or debit card that shows you’re USAA number on it. Unfortunately, you only can get one of those if you are/were part of the Armed Forces or are an immediate family member. When I had the issues above, the sales representatives did ask me for a credit or debit card showing my USAA number, but I told them I did not have one. So, they asked me to show them my USAA number on my phone and they accepted it. YMMV of course. 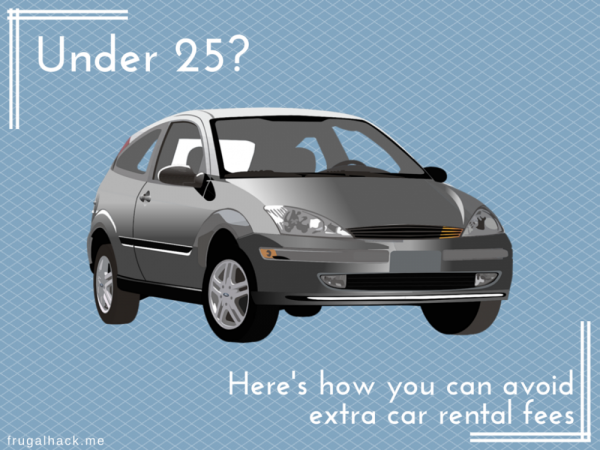 If you’re under 25 and you need to rent a car, this is by far the best way to do it. 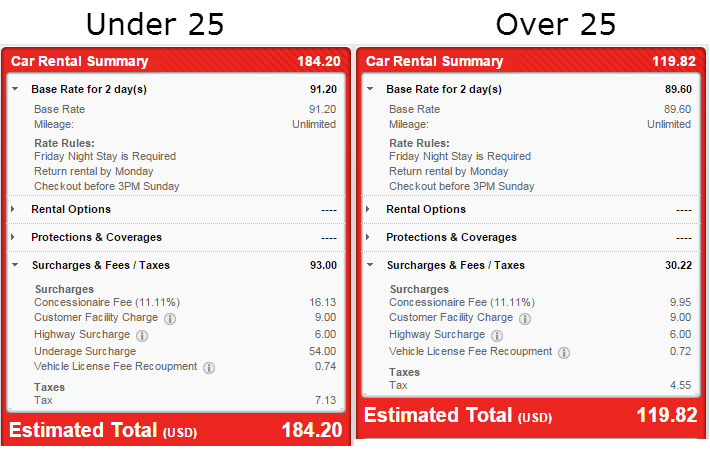 The underage fees are just astronomical, where it doesn’t make sense to rent a car through any other discount travel company (e.g. Ultimate Rewards Travel, Expedia, Costco). 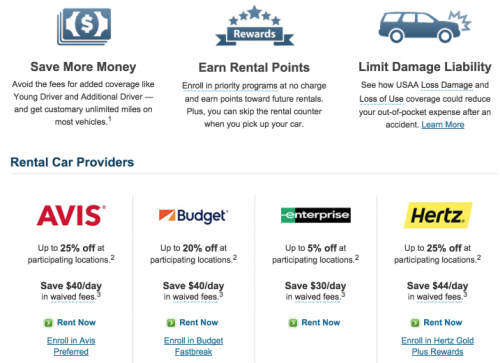 Have you ever used USAA to rent a car? If so, what was your experience? Is Turo the Cheapest Way to Rent a Car?